On Friday, Oct. 13, the Center for Advanced Teaching and Assessment in Clinical Simulation (ATACS) hosted its fifth annual Clinical Simulation Conference. The event is an opportunity for medical professionals from all facets of the health care field — doctors, residents, physician assistants, registered nurses and students alike — to practice their clinical skills in a safe, multidisciplinary environment. Sanja Kupesic Plavsic, M.D., Ph.D., director of the ATACS Center at Texas Tech University Health Sciences Center El Paso (TTUHSC El Paso), believes clinical simulation can benefit practicing physicians just as much as medical students. “Medical errors are the third cause of mortality in this country,” said Dr. Kupesic. A 2016 study published in The BMJ estimates medical errors could be responsible for over 250,000 deaths annually in the U.S. A 2013 study published in the Journal of Patient Safety put the number even higher, at 400,000. That’s the equivalent of two 747 crashes a day. “If we can prevent at least part of these medical errors through interprofessional clinical simulation, that is our goal,” said Dr. Kupesic. To simulate a real-life clinical experience, the center uses state-of-the-art animatronic manikins that replicate anything from childbirth to signs and symptoms of disease. ATACS trainings also incorporate “standardized patients,” real people trained to act out clinical scenarios. These interactions help medical professionals recognize and effectively treat certain conditions while developing their bedside manner and communication skills. 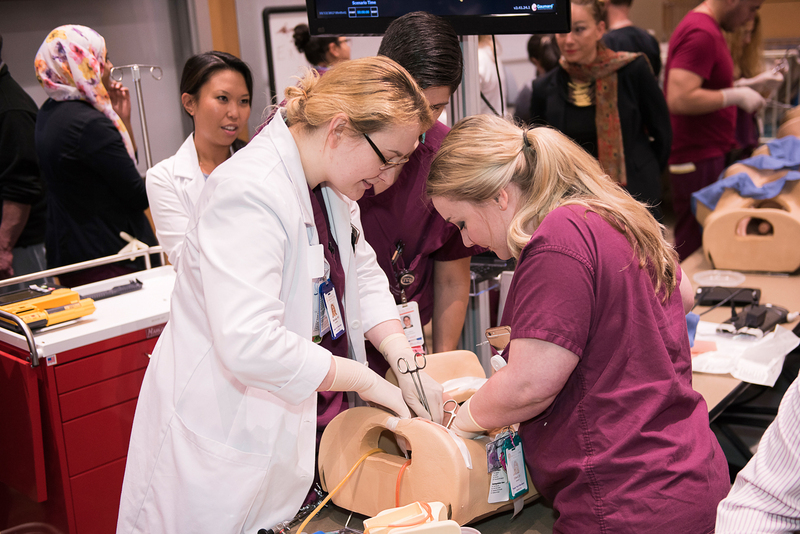 Students practice a pelvic procedure on one of the ATACS Center’s animatronic manikins at the 5th Annual Clinical Simulation Conference. This year’s simulation workshops focused on four tracks: obstetrics and gynecology, orthopaedic surgery, pediatrics and interprofessional skill-building. Using the lab’s manikins, participants practiced how to stop bleeding in patients with pelvic trauma; conduct a knee and shoulder arthroscopy (a surgical technique used to diagnose joint problems); address pediatric emergencies in an outpatient setting; and prepare for post-surgery complications as a care team. “Interprofessional simulation is important because medicine is practiced in teams,” said Dr. Kupesic. “If we can improve collaboration between disciplines, we’ll not only be providing better care to patients, but this will also significantly reduce the number of medical errors,” she explained. Clinical simulation is an integral part of the Paul L. Foster School of Medicine (PLFSOM) curriculum. Throughout their program, medical students encounter 140 different clinical presentations, and spend two hours in hands-on practice per week during their first two years. This early immersion is part of what sets the PLFSOM apart from other medical schools; most medical programs in the U.S. have limited exposure to clinical skills in the preclinical years. TTUHSC El Paso is the only medical school in Texas to house a simulation center accredited by the Society for Simulation in Healthcare. ATACS is accredited based on the following standards: teaching/education, assessment and research. In order to remain accredited, the center’s key faculty and staff must be certified in clinical simulation. In addition, the center must offer the latest technologies; constantly evolve its experiential learning opportunities in different disciplines; and advance scholarship in clinical skills and simulation. In 2017 alone, ATACS published five peer-reviewed articles related to clinical skills in simulation, two DVDs and one book involving 20 faculty from eight departments. The Clinical Simulation Conference is a coordinated effort between the PLFSOM, the GGHSON, ATACS, the Regional Simulation and Training Center (the GGHSON’s simulation lab) and University Medical Center of El Paso.